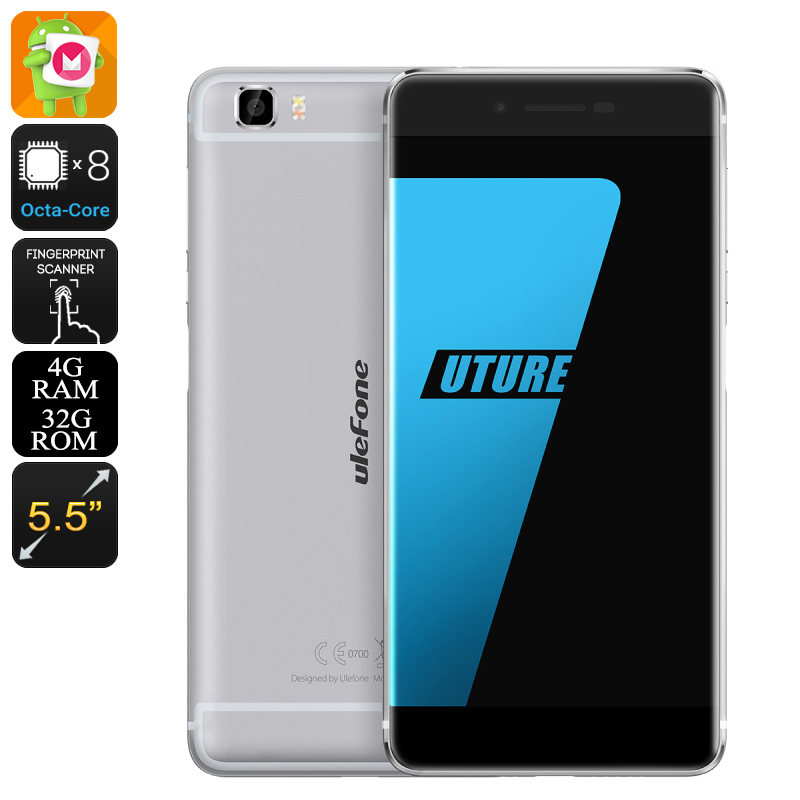 Successfully Added Ulefone Future Smartphone - Android 6.0, 4GB RAM, Octa Core CPU, 5.5 Inch Full HD Screen (Grey) to your Shopping Cart. Take your user experience to an entirely new level with the Ulefone Future Smartphone. With its bezel-less 5.5 Inch display this amazing Smartphone delivers an infinite visual impression like you never experienced before. With the Ulefone Future Smartphone your visual experience will be limitless. Worthy of its name, this powerful Smartphone with its innovative display truly does give us a peek into the future of Smartphones. Giving a new meaning to "fast"
Featuring a Heilo P10 Octa-Core CPU running at nearly 2GHz and 4GB of RAM the Ulefone Future packs some real power and can deal with any Apps, games, and FHD movies without breaking a sweat. Thanks to its powerful hardware this Smartphone is furthermore a pro when it comes to multitasking – guaranteeing a fast and smooth operation even when multiple applications are used simultaneously. With its 32GB worth of internal memory and an additional 128GB of external storage this Smartphone of the future will save you from the burden of deleting old files. From now on you never have to worry again about running out of space to safe all your favorite Apps, movies, or pictures. Equipped with a 3000mAh battery this Android Smartphone provides up to 15 hours of continuous usage time, enough for you to take the most out of this powerful device along with all its amazing features without the fear running out of juice. With its Android 6.0 Operating System this cell phone offers you a prettier User Interface, more convenient search options, enhanced system protection, higher energy efficiency, and a higher user experience in general compared to previous Operating Systems. On the Ulefone Future you are guaranteed to take to most out of this latest Operating System. Its double IMEI number along with the possibility to insert two SIM cards that can both be connected to different 4G networks simultaneously gives you the possibility to easily and efficiently separate your work and private live. Being connected to two different 4G networks additionally enables you to be constantly connected no matter where you go. Beautiful Smartphones often are fragile, however, with the extra protection features of this Android Smartphone you won’t have to be afraid of going out on a little adventure. Its bezel-less 5.5 Inch display is protected by metal alloy body that has been covered with invulnerable Gorilla 3 protective glass. Scratches, bumps, or drops are very unlikely to negatively influence this Smartphone. Equipped with an epic 16MP rear camera this Smartphone will offer you stunning sharpness and detail when snapping pictures of all special moments in life. Likewise its 5MP snapper located on the front of the phone gives all you selfie lovers a way to capture every special future moment you and your friends will share..